When the winds of change blow, some build walls while change leaders create bridges. 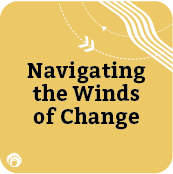 This workshop answers the question, “What do I need to know about change management to lead change in my organization?” and draws upon our more than 20 years of experience in managing change in all areas of government, non-profits and the private sector. It shares insights into the challenges associated with change and offers a practical framework for effective change leadership. It will broaden your perspective of what it takes to be a change leader tasked with managing change in your organization and will explain how creativity is a critical change leadership skill. In this highly interactive workshop you will participate in thought-provoking discussion and walk out with tools and strategies that you can immediately implement in your organization. Appreciate the value of creativity to change leadership. Learn how different change initiatives require different approaches. Understand obstacles and opportunities to change. Learn a protocol for effective change leadership. Make sense of change methods and change management strategies. Develop empathy for the human factors associated with organizational change.